Christmas dinner is traditionally a meat-laden affair, but that shouldn't stop vegetarians from enjoying the festivities. Whether you're a relative novice catering for vegetarian dinner guests or a seasoned pro searching for new inspiration, this collection of vegetarian Christmas recipes is bound to provide you with plenty of fresh ideas. Throwing a Christmas party? Plan ahead and whip up a few different varieties of vegetarian canapés to protect your guests against quaffing too many of your delicious Christmas cocktails. Nathan Outlaw's Cheese straw recipe makes a fantastic festive snack, or for those aiming to impress Kevin Mangeolles' elegant Red pepper purée with goats' cheese canapé or Frances Atkins' luxurious Truffle sandwich will add a sophisticated touch to any party. Filo is a popular fixture of Christmas party platters, but try a colourful twist on the norm with Deena Kakaya's vegetable spring rolls recipe packed with vibrant beetroot, squash and paneer. There are plenty of vegetarian Christmas dinner ideas, too. 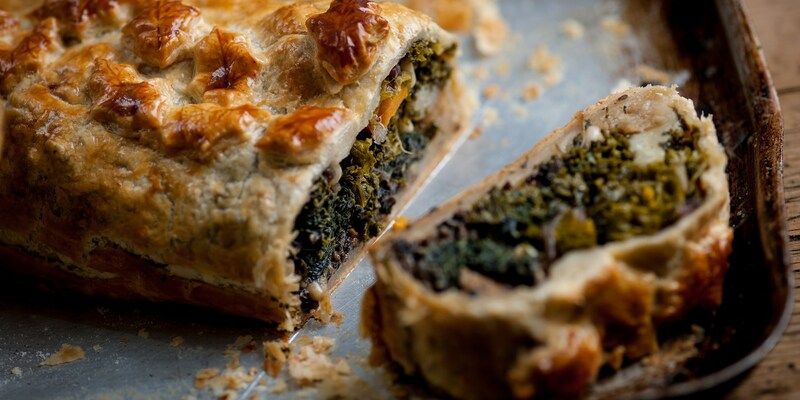 Try Andy Waters' Vegetarian Wellington recipe as a fantastic Christmas dinner centrepiece, with golden puff pastry packed with vegetables, herbs and chestnuts for a festive touch. Similarly James Mackenzie packs chestnuts into his Vegetable stew before topping it with a herby crumb topping and crispy kale for extra texture — the perfect dish to serve alongside all the (veggie) trimmings at Christmas dinner. Graham Campbell's Vegetarian haggis recipe makes a delicious and filling alternative Christmas dinner, and try one of the vegetarian starters in this collection — such as Lee Westcott's signature Yeasted cauliflower dish — for an impressive way to begin your Christmas dinner menu. If you're cooking for vegetarian guests it's worth bearing in mind that many popular cheeses are made using animal rennet, and therefore are not completely vegetarian. While some people don't mind eating animal rennet cheeses it is always worth checking with your guests beforehand as there are plenty of vegetarian cheese alternatives available if they'd prefer.